About Grover ProSince 1979, Grover Pro’s products have been in strong demand and can be found in virtually every corner of the world, from Alaska to Australia, California to Russia, and everywhere in between! Grover Pro Percussion was founded in 1980 by Boston-based percussionist Neil Grover. The company’s mission has remained the same ever since: To supply the world’s finest percussion products for professionals, students, and performing ensembles. Aiming to reproduce the sound of the Boston Symphony’s vintage Leedy triangle, which had a sonic sparkle when struck, Neil’s natural curiosity led him to explore why that particular triangle had such uniquely vibrant musical sound qualities. Enlisting the help of students at the Massachusetts Institute of Technology Acoustics and Vibrations Lab, Neil set out to uncover the secret of creating a triangle with prominent overtone resonance. As a result of his extensive research, Neil crafted a 9-inch triangle for his personal use. 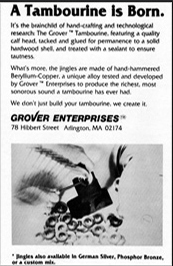 Starting a percussion manufacturing company was the furthest thing from Neil’s mind, but when Boston’s percussionists heard the “Grover” triangle, they insisted that Neil make one for them. Neil started making triangles, one at a time, to satisfy the requests of his Boston-based colleagues. Word quickly spread, and to his great surprise, Neil started to receive calls from top percussionists around the globe. Unintentionally, the Grover® Super-Overtone™ triangle was born. Neil followed his triangles with tambourines, mallets, woodblocks, snare drums, and other percussion products. Neil developed and tested each product personally, ensuring a high level of quality control that remains unparalleled in the industry. In 1992 the company incorporated and moved to an industrial space north of Boston. The company quickly outgrew its workspace and, in 1994, moved to a significantly larger manufacturing complex. To meet the growing demands for Grover products, the company invested in highly customized machinery and tooling. As the company grew, Neil assembled a dedicated staff of percussion specialists to ensure that his personal commitment to percussion was embodied within the company’s infrastructure. In 2006 the Discovery Channel’s “How It’s Made” filmed two segments at Grover Pro Percussion. The popularity of the show exposed Grover Pro’s products to millions of viewers around the globe. Neil happened to be performing in Norway when he first viewed the episode! Today, Grover Pro Percussion Inc. is located in Woburn, MA, adjacent to America’s Technology Highway. The company employs a dedicated team of percussion specialists, production experts, and seasoned business managers. Despite his busy schedule, Neil Grover serves as President and CEO. Neil’s products are known throughout the world as among the finest musical instruments ever made! Neil W. Grover holds the distinction of performing with one of the world’s foremost orchestras (Boston Symphony) on the soundtrack for one of the most successful blockbuster movies of all time (Indiana Jones and the Temple of Doom) and with the iconic rock band, Aerosmith. Neil is a renowned percussionist, accomplished music educator, imaginative product innovator, and successful entrepreneur. 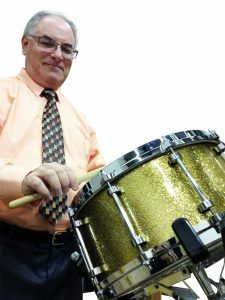 He is the founder and president of Grover Pro Percussion Inc., a market leader in the design, manufacture, and distribution of world-class percussion instruments. At the young age of 23, Neil was appointed Principal Percussionist of the Opera Company of Boston, a position he held for seven seasons. As his career progressed, he found himself in demand for all musical genres, including symphony, chamber music, ballet, opera, and commercial recordings. Highlights of his collaborations include the Royal Ballet, Bolshoi Ballet, American Ballet Theatre, Dance Theatre of Harlem, Music from Marlboro, Indianapolis Symphony, Boston Musica Viva, and the Empire Brass. He was chosen to record the percussion tracks for Phillip Glass’ film soundtrack for Mishima. In addition, Neil appears as a Boston Pops percussionist in the hit movie Blown Away, starring Jeff Bridges and Tommy Lee Jones. He has toured with Music From Marlboro, Boston Symphony, Henry Mancini, Boston Symphony Chamber Players, and the Broadway production of The Pirates of Penzance. Since 1977, he has performed, recorded, and toured with the world-famous Boston Pops, where he has made music under the batons of Maestros Arthur Fiedler, John Williams, and Keith Lockhart. Having performed regularly in the percussion section of the Boston Symphony for over 35 years, he has worked with Maestros Seiji Ozawa, James Levine, Leonard Bernstein, Aaron Copland, Colin Davis, Charles Dutoit, Colin Davis, Neemi Jaarvi, Rafael Fruhbeck de Burgos, Mstislav Rostropovich, and Bernard Haitink. It is noteworthy that Neil has performed in over 1,500 concerts as a percussionist with the BSO & Boston Pops. Neil’s percussive talents have been heard by thousands at renowned venues, such as Boston’s Symphony Hall, Carnegie Hall, Chicago’s Orchestra Hall, and festivals at Tanglewood, Hollywood Bowl, Wolf Trap, Blossom, and Ravinia. In addition, he has performed for millions of listeners through television and radio broadcasts on the NBC, CBS, NHK, PBS, A&E and NPR networks. At the request of composer John Williams, Neil joined the multi-media musical extravaganza, “Star Wars in Concert”, serving as Principal Percussionist on two legs of their North American Tour. Neil shares his vast knowledge of professional percussion techniques and career development through educational outreach programs and publications. As one of the field’s most prolific and requested clinicians, he has given presentations at over 100 colleges and universities throughout the USA and Canada. He is equally in demand overseas, having led master classes at such venerable institutions as the Sydney Conservatory (Australia), Conservertoire de Paris, London’s Royal College of Music & Guildhall School (England), Royal Northern College of Music (UK), Royal Conservatory (Scotland), and throughout Japan, Korea, and Europe. Neil has been an invited clinician at over 50 state and international days of percussion, including the Texas Music Educators Association Conference, Midwest Band and Orchestra Conference, Iowa Bandmasters Convention, and five times at the Percussive Arts Society International Convention. Neil Grover has written/co-authored five publications: Four Mallet Primer, Four Mallet Fundamentals, Art of Triangle & Tambourine Playing, Percussionist’s Cookbook, and The Art of Percussion Playing, all published by Meredith Music. He has written articles for School Band & Orchestra, Percussive Notes, and Drum Tracks. Neil’s innovative designs and cutting edge manufacturing techniques have set a new standard for the ergonometric functionality of modern day percussion instruments. Neil and his company have been featured in many publications, including: Percussive Notes, Modern Drummer, School Band & Orchestra, Musical Merchandise Review and on two episodes of the Discovery Channel’s series How It’s Made. Formerly the Chair of the Percussion Programs at both The Boston Conservatory and the University of Massachusetts-Lowell, today, Neil’s students occupy leading positions in many top performing, educational and music business organizations. Neil has served on the Board of Directors of the Percussive Arts Society and the Winchester Community Music School, one of America’s top community music schools. Neil is married to Tony Nominated Broadway actress Maureen Brennan.